Aoife O'Brien: DB [Deutsche Boerse] have their own collection, and your work is included in that collection; they clearly think that your work is significant and of the moment, though you have been working on this series for some time, since 1994 in fact. Why do you think your work is being seen as contemporary or significant at this moment? Or does this not enter into your practise at all? Joerg Sasse: I'm very much in the work and in the process of the work. One thing comes after the other and it's completely different to what happens outside. So therefore it's a strange question... When I first showed so-called computer manipulated works it was at Galerie Wilma Tolksdorf in 1995. It was after two years working with photography transformed on the computer. All photography is some kind of transformation. If you want to do it or if you don't want to do it, it is. It leaves out everything and just leaves the crop, the Ausschnitt, and even in this you bring all three dimensions onto a plane, you reduce it. So you can do it with your eyes or with this tool, the camera. For me the camera has always been a tool; before I was using a large format camera... working in 4 x 5 inches. The main reason for that was that I was able to shift, in the technical sense, meaning that you can have control over the perspective like you have making a drawing... For me using the computer helped me to come close to what I was looking for. In the work that I did before I was looking for some kind of everyday life, and this life led me to flats and to people who showed me their own photographs. And this everyday life was, in a sense, transformed in their own photographs. It was not based on an artistic idea, it just happened, and it was another source for me to find something about this life which won't be written into history because it is ment to be too unimportant. AOB: Do you ever still have that desire to pick up a camera - are you ever still compelled to make your own image? JS: I started again a couple of years ago to make snapshots. When I began to rework amateur material on the computer I also looked to my own archive, and I sometimes use my own snapshots as a source material... it's not so important [where the image comes from], what's important is that it has a power of visuality. This is the main point and it's a problem to talk about this work, because I'm looking for something on the other side of language. AOB: That said, it's been written that you empower these images, you bring them to life or reveal the life that is inherent. When you have the finished image, how do you feel the balance lies between what was there to begin with and your manipulation. JS: I think it generally loses everything of what was there to start with. 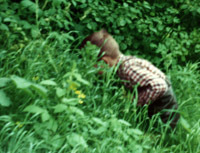 That was the reason why I failed in the '80s, when I tried to work with amateur photographs for the first time. But I didn’t have the computer as a tool, so I cropped and made photographic reproductions and I couldn't get rid of the privacy in it, so I stopped. Now I've published sketches, which show my point of departure... You can see it in the Grenoble catalogue, and you will see that they are very much related to time, to the last 50 years, and maybe you also get the idea of coming round the world, as they were taken over four continents. This relation to a time, to a more or less personal event, is the point I remove. JS: Mostly I don't know who took the images; I buy them through auctions on the internet when people die or couples split up or whatever and want to divide up possessions. And I practice a lot! I do hundreds and hundreds of sketches, and I try to find out how it works without understanding what's behind it, how does it work visually. There are very different components to doing it: a kind of picture analysis, but the greatest part is the training. I need to work on an image to find out; I can't think what happens. I have an idea, and I look to see if I can come closer to it. It often doesn't work, and I throw it away. AOB: Some of what you create with digital effects seems reminiscent of the early days of digital technology. It made me think of how SLR cameras are used less and less popularly, and so the difference between intent and the finished image is narrowed, insofar as when it is instantaneous, a photograph can be retaken if it is not what the taker wants. Also, how early digital images were valued, though now we have become blase about how much we can achieve. Are these concerns of yours? JS: There are two different levels of this question: the one is what has really happened in the last 10 years of my work. The first perspectival changes I made with the computer were telling the computer to do it, and then I'd go shopping or drink coffee, and after two hours there was a signal to say it had been calculated. I'd look at it, think, it's no good, I'll try again. Now the technical effort and the resolution are much higher. I don't think that matters in my work, because before I did take the time to wait and work on a piece. On the other level, in the direction of content, in the first years I was working with the colour, as photographic colour is so specially linked to time, that you can say without knowing anything about the subject, this must be from the '70s. In the first years I was playing about with the colours to play around with this time. So earlier works were more about the time the basic material came from, now it's still important, but I feel free enough just to decide it on my own without thinking so much about it. I'm sure that there's a visual power in the basic material. There must be a reason why billions of photographs are taken every day; what is intended by doing it fails most of the time, but everyone does it again and again. AOB: Improvements in technology have thus only been to your advantage... Do they also eliminate the private to some extent? JS: Not in everyday photography. Maybe we are getting "better"... but for me photography is one medium in art, and I like to play with the options it gives me. AOB: Certain of your works resemble Richter works; one is not immediately drawn to make parallels with other photographers. Who do you see as your peers in art? JS: Richter always works in conceptual series; he never wants to be responsible for one special work, so he makes variations, this idea of fighting against the idea of the artist as a genius, related to his time. I don't think the artist is a genius, so I don't have to fight with it! AOB: Do you aspire to the idea of creating a "work of art"? Does that frame mean anything to you? JS: The art world is the only place where my work can exist. I think it's worth seeing -- I may be wrong, but I think so -- so my next question must be "How can it be seen?" Where is a space for it that is not taken over by interests, interests in the content or political interests, a space that is free, where maybe there is the possibility to look at it twice? So I think the art world is quite a good context, even if it is commercial too. AOB: But the image has an inherent power? JS: I don't try to find a solution, but an offer. Just one. Then I look for a new image, not a variation. I have an output of 10 or 12 works a year; I'm now showing sketches, but they are not variations of what images could have been. It's up to me to say, this is my decision to stop here. I'm responsible for it, but I don't know whether it's wrong or right. AOB: How does the selection process begin? JS: I begin with a very fast look through the material, mostly slides. Going through, picking out what touches my eyes before my brain starts understanding it. So that may be just 10% that I choose. In the second view I see that maybe I was caught up with an aesthetic or formulistic idea so I throw more away. Then I scan this selection and try to rework them very fast on the computer -- cropping, colour, removing of details, and, importantly, the perspective. And I go through the sketches again and again and again. I categorise the sketches, and it's not important that I make a work straight away, but that if I see a sketch for the fourth or fifth time, and it stays in my imagination, and it still touches me without my being able to explain why. That's a good point for me to begin to start work on it, trying to find out what this power is.